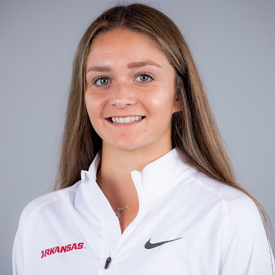 Sawyers season began and ended with the Chile Pepper Festival (Oct. 1) where she ran a 17:41.00, placing her as 26th overall and 14th for the Razorbacks. Three-time 800-meter national champion … Three -time OFSAA 800-meter champion … Two-time OFSAA 400-meter medalist … Holds two OFSAA 800-meter records … 800-meter runner-up at 2013 New Balance Nationals. Born on May 22, 1997 … Daughter of Tom and Deb Sawyer … Has one brother, Kyle … Majoring in kinesiology … Hopes to medal at NCAAs , represent Canada at the 2016 World Junior Championships and long-term represent Canada at the Olympics.